Zihin kuramı başkalarının görünen davranışlarını zihinsel durumlarına atıfla açıklayabilme yetisine işaret etmektedir. Zihin kuramı, sosyal işlevselliğin ve kişilerarası ilişkilerin sürdürülmesinin ayrılmaz bir parçası olarak düşünülmektedir. Major depresif bozukluğun önemli klinik özelliklerinden biri sosyal ve kişilerarası işlevlerde bozulma olmasıdır. Major depresyon tanısı olan kişilerin kişilerarası zorlukları yaygınlaşmış olduğundan, bu sosyal eksikliklerin altında yatan bilişsel mekanizmaların daha ayrıntılı bir şekilde anlaşılması büyük önem taşımaktadır. Bu kapsamda, bu makalede major depresif bozuklukta zihin kuramı yetisinin incelenmesi amaçlanmıştır. Araştırmaları bulguları sonuçların farklılaşmasına sebep olacak muhtemel açıklamalar ile ele alındığında major depresif bozukluğa sahip bireylerde görülen sosyal ve kişilerarası alanlardaki zorlukların, en azından kısmen, duygusal uyaranları ve zihinsel durumları doğru yorumlama yeteneğindeki bozulmalara bağlı olabileceği düşünülmüştür. APA (1994) Diagnostic and Statistical Manual for Mental Disorders, 4th edition (DSM-IV). Washington DC, American Psychiatric Association. Bailey PE, Henry JD (2008) Growing less empathic with age: Disinhibition of the self-perspective. J Gerontol B Psychol Sci Soc Sci, 63:P219-P226. Bach L, Happé F, Fleminger S, Powell J (2000) Theory of mind: Independence of executive function and the role of the frontal cortex in acquired brain injury. Cogn Neuropsychiatry, 25:175-192. Baron-Cohen S, Leslie AM, Frith U (1985) Does the autistic child have a “theory of mind”? Cognition, 21:37-46. Baron-Cohen S, O’Riordan M, Jones R, Stone V, Plaisted K (1999) A new test of social sensitivity: Detection of faux pas in normal children and children with Asperger syndrome. J Autism Dev Disord, 29:407-418. Baron-Cohen S, Wheelwright S, Skinner R, Martin J, Clubley E (2001) The Autism-spectrum quotient (AQ): Evidence from Asperger syndrome/high-functioning autism, malesand females, scientists and mathematicians. J Autism Dev Disord, 31:5-17. Baxter AJ, Patton G, Scott KM, Degenhardt L, Whiteford HA (2013) Global epidemiology of mental disorders: what are we missing? PLoS One, 8:e65514. Bora E, Eryavuz A, Kayahan B, Sungu G, Veznedaroglu B (2006) Social functioning, theory of mind and neurocognition in outpatients with schizophrenia; mental state decoding may be a better predictor of social functioning than mental state reasoning. Psychiatry Res, 145:95-103. Bora E (2009) Şizofreni spektrum bozukluklarında zihin kuramı. Turk Psikiyatri Derg, 20:269-281. Brüne M (2005) “Theory of mind” in schizophrenia: a review of the literature. Schizophr Bull, 31:21-42. Brüne M, Brüne-Cohrs U (2006) Theory of mind-evolution, ontogeny, brain mechanisms and psychopathology. Neurosci Biobehav Rev 2006; 30:437–455. Colle L, Baron-Cohen S, Hill J (2007) Do children with autism have a theory of mind? A non-verbal test of autism vs. specific language impairment. J Autism Dev Disord, 37: 716-723. Corcoran R, Mercer G, Frith CD (1995) Schizophrenia, symptomatology and social inference: investigating theory of mind in people with schizophrenia. Schizophr Res, 17:5–13. Cusi AM, Nazarov A, MacQueen GM, McKinnon MC (2013) Theory of mind deficits in patients with mild symptoms of major depressive disorder. Psychiatry Res, 210:672-674. Csukly G, Czobor P, Szily E, Takács B, Simon L (2009) Facial expression recognition in depressed subjects: the impact of intensity level and arousal dimension. J Nerv Ment Dis, 197:98-103. Csukly G, Telek R, Filipovits D, Takács B, Unoka Z, Simon L (2011) What is the relationship between the recognition of emotions and core beliefs: associations between the recognition of emotions in facial expressions and the maladaptive schemas in depressed patients. J Behav Ther Exp Psychiatry, 42:129-137. Dalili MN, Penton-Voak IS, Harmer CJ, Munafò MR (2015) Meta-analysis of emotion recognition deficits in major depressive disorder. Psychol Med, 45:1135-1144. Dolan M, Fullam R (2004) Theory of mind and mentalizing ability in antisocial personality disorders with and without psychopathy. Psychol Med, 34:1093-1102. Donges US, Kersting A, Dannlowski U, Lalee-Mentzel J, Arolt, V, Suslow T (2005) Reduced awareness of others’ emotions in unipolar depressed patients. J Nerv Ment Dis, 193:331-337. Drubach, DA (2008) The purpose and neurobiology of theory of mind functions. Relig Health, 47:354-365. Evans VC, Iverson GL, Yatham LN, Lam RW (2014) The relationship between neurocognitive and psychosocial functioning in major depressive disorder: a systematic review. J Clin Psychiatry, 75:1359-1370. Fett AKJ, Viechtbauer W, Penn DL, van Os J, Krabbendam L (2011) The relationship between neurocognition and social cognition with functional outcomes in schizophrenia: a meta-analysis. Neurosci Biobehav Rev, 35:573-588. Frith CD (1992) The Cognitive Neuropsychology of Schizophrenia. Hillsdale, NJ, Lawrence Erbaum Associates. Flavell JH (1999) Children’s knowledge about the mind: cognitive development. Annu Rev Psychol, 50:21-45. Fonagy P, Leigh T, Steele M, Steele H, Kennedy R, Mattoon G et al. (1996) The relation of attachment status, psychiatric classification, and response to psychotherapy. J Consult Clin Psychol, 64:22-31. Gál Z, Egyed K, Pászthy B, Németh D (2010) Impaired theory of mind in anorexia nervosa. Psychiatr Hung, 26:12-25. Gallese V, Goldman A (1998) Mirror neurons and the simulation theory of mindreading. Trends Cogn Sci, 2:493-501. Gollan JK, Pane HT, McCloskey MS, Coccaro EF (2008) Identifying differences in biased affective information processing in major depression. Psychiatry Res, 159:18-24. Gollan JK, McCloskey M, Hoxha D, Coccaro EF (2010) How do depressed and healthy adults interpret nuanced facial expressions? J Abnorm Psychol, 119:804-810. Gopnik, A (2003) The theory theory as an alternative to the innateness hypothesis. In Chomsky and His Critics (Eds LM Antony, N Hornstein): 238-254. New York, Basil Blackwell. Gotlib, IH, Beach, SR (1995) A marital/family discord model of depression: implications for therapeutic intervention. In Clinical Handbook of Couple Therapy (Eds NS Jacobson, AS Gurman):411-436. New York, Guilford Press. Gotlib, IH, Robinson, LA (1982) Responses to depressed individuals: discrepancies between self-report and observer-rated behavior. J Abnorm Psychol, 91:231-240. Goswami, U (2002) Blackwell Handbook of Childhood Cognitive Development. Oxford, Blackwell. Hadwin J, Baron-Cohen S, Howlin P, Hill K (1997) Does teaching theory of mind have an effect on the ability to develop conversation in children with autism? J Autism Dev Disord, 27:519-537. Harkness KL, Jacobson JA, Duong D, Sabbagh MA (2010) Mental state decoding in past major depression: effect of sad versus happy mood induction. Cogn Emot, 24:497-513. Harkness KL, Washburn D, Theriault JE, Lee L, Sabbagh MA (2011) Maternal history of depression is associated with enhanced theory of mind in depressed and nondepressed adult women. Psychiatry Res, 189:91-96. Harrington L, Siegert RJ, McClure J (2005) Theory of mind in schizophrenia: a critical review. Cogn Neuropsychiatry, 10:249-286. Herold R, Tényi T, Lénárd K, Trixler M (2002) Theory of mind deficit in people with schizophrenia during remission. Psychol Med, 32:1125–1129. Hirschfeld R, Montgomery SA, Keller MB, Kasper S, Schatzberg AF, Möller HJ et al. (2000) Social functioning in depression: a review. J Clin Psychiatry, 61:268-275. Howlin P, Baron-Cohen S, Hadwin J (1999) Teaching Children with Autism to Mind Read: a Practical Guide. New York, Wiley. Hutchins TL, Prelock PA, Chace W (2008) Test-retest reliability of a theory of mind task battery for children with autism spectrum disorders. Focus Autism Other Dev Disabl, 23:195-206. Inoue Y, Yamada K, Hirano M, Shinohara M, Tamaoki T, Iguchi H et al. (2006) Impairment of theory of mind in patients in remission following first episode of schizophrenia. Eur Arch Psychiatry Clin Neurosci, 256:326-328. Irani F, Platek SM., Panyavin IS., Calkins ME., Kohler C, Siege, SJ. (2006) Self-face recognition and theory of mind in patients with schizophrenia and first-degree relatives. Schizophr Res, 88:151–160. Irani F, Seligman S, Kamath, V, Kohler C, Gur, RC (2012) A meta-analysis of emotion perception and functional outcomes in schizophrenia. Schizophr Res, 137:203-211. Jannsen I, Krabbendam L, Jolles J, Van Os J (2003) Alterations of theory of mind in patients with schizophrenia and nonpsychotic relatives. Acta Psychiatr Scand, 108:110-117. Kerr N, Dunbar RI, Bentall RP (2003) Theory of mind deficits in bipolar affective disorder. J Affect Disord, 73:253-259. Kraml H, Michlmayr M (2002) Simulation versus theory theory. theories concerning the ability to read minds (Masters thesis). Innsbruck, Austria, Leopold-Franzens University. Ladegaard N, Larsen ER, Videbech P, Lysaker PH (2014) Higher-order social cognition in first-episode major depression. Psychiatry Res, 216:37-43. Lee L, Harkness KL, Sabbagh MA, Jacobson JA (2005) Mental state decoding abilities in clinical depression. J Affect Disord, 86:247-258. Leppänen JM, Milders M, Bell JS, Terriere E, Hietanen JK (2004) Depression biases the recognition of emotionally neutral faces. Psychiatry Res, 128:123-133. Manstead AS, Dosmukhambetova D, Shearn J, Clifton A (2013) The influence of dysphoria and depression on mental state decoding. J Soc Clin Psychol, 32:116-133. Marjoram D, Miller P, McIntosh AM, Owens DGC, Johnstone EC, Lawrie S (2006) A neuropsychological investigation into ‘Theory of Mind’ and enhanced risk of schizophrenia. Psychiatry Res, 144:29–37. Mattern M, Walter H, Hentze C, Schramm E, Drost S, Schoepf D et al. (2015) Behavioral evidence for an impairment of affective theory of mind capabilities in chronic depression. Psychopathology, 48:240-250. Mazza M, De Risio A, Surian L, Roncone R, Casacchia M (2001) Selective impairments of theory of mind in people with schizophrenia. Schizophr Res, 47:299-308. Meltzoff AN (1999) Origins of theory of mind, cognition and communication. J Commun Disord, 32:251-269. Mizrahi R, Korostil M, Starkstein ES, Zipursky RB, Kapur S (2007) The effect of antipsychotic treatment on theory of mind. Psychol Med, 37:595-601. Nejati V, Zabihzadeh A, Maleki G, Tehranchi A (2012) Mind reading and mindfulness deficits in patients with major depression disorder. Procedia Soc Behav Sci, 32:431-437. Paykel ES (1994) Life events, social support and depression. Acta Psychiatr Scand, 89:50-58. Perner J, Frith U, Leslie AM, Leekam SR (1989) Exploration of the autistic child’s theory of mind: Knowledge, belief, and communication. Child Dev, 60:689-700. Perner J, Lang B (1999) Development of theory of mind and executive control. Trends Cogn Sci, 3:337-344. Pinkham AE, Penn DL, Perkins DO, Liberman J (2003) Implications for the neural basis of social cognition for the study of schizophrenia. Am J Psychiatry, 160: 815-824. Poletti M, Sonnoli A, Bonuccelli U (2014) Mild depressive symptoms are associated with enhanced affective theory of mind in nonclinical adult women. J Neuropsychiatry Clin Neurosci, 26:E63-E64. Premack D, Woodruff G (1978) Does the chimpanzee have a theory of mind? Behav Brain Sci, 1:515-526. Roncone R, Falloon IR, Mazza M, De Risio A, Pollice R, Necozine S et al. (2002) Is theory of mind in schizophrenia more strongly associated with clinical and social functioning than with neurocognitive deficits? Psychopathology, 35:280-288. Sabbagh MA (2004) Understanding the orbitofrontal contributions to theory of mind reasoning: implications for autism. Brain Cog, 55:209-219. Schneider W, Schumann-Hengsteler R, Sodian B (2014) Young Children's Cognitive Development: Interrelationships among Executive Functioning, Working Memory, Verbal Ability and Theory of Mind. 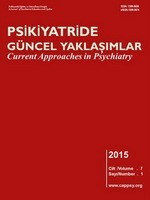 New York, Psychology Press. Scholl BJ, Leslie AM (1999) Modularity, development and ‘theory of mind’. Mind Lang, 14:131-153. Seidel EM, Habel U, Finkelmeyer A, Schneider F, Gur RC, Derntl B (2010). Implicit and explicit behavioral tendencies in male and female depression. Psychiatry Res, 177:124-130. Shamay-Tsoory SG, Aharon-Peretz J (2007) Dissociable prefrontal networks for cognitive and affective theory of mind: a lesion study. Neuropsychologia, 45:3054-3067. Shamay-Tsoory, SG, Shur S, Barcai-Goodman L, Medlovich S, Harari H, Levkovitz Y (2007) Dissociation of cognitive from affective components of theory of mind in schizophrenia. Psychiatry Res, 149:11-23. Steele S, Joseph RM, Tager-Flusberg H (2003) Brief report: Developmental change in theory of mind abilities in children with autism. J Autism Dev Disord, 33:461-467. Suslow T, Konrad C, Kugel H, Rumstadt D, Zwitserlood P, Schöning S et al. (2010) Automatic mood-congruent amygdala responses to masked facial expressions in major depression. Biol Psychiatry, 67:155-160. Tager-Flusberg H, Sullivan K (2000) A componential view of theory of mind: Evidence from syndrome. Cognition, 76:59-90. Tomasello M, Carpenter M, Call J, Behne T, Moll H (2005). Understanding and sharing intentions: The origins of cultural cognition. Behav Brain Sci, 28:675-691. Trivers, RL (1971) The evolution of reciprocal altruism. Q Rev Biol. 46:35-57. Uekermann J, Channon S, Lehmkämper C, Abdel-Hamid M, Vollmoeller W, Daum I (2008) Executive function, mentalizing and humor in major depression. J Int Neuropsychol Soc, 14:55-62. Weightman MJ, Air TM, Baune BT (2014) A review of the role of social cognition in major depressive disorder. Front Psychiatry, 5:179-192. Wilbertz G, Brakemeier EL, Zobel, Härter M, Schramm E (2010) Exploring preoperational features in chronic depression. J Affect Disord, 124:262-269. Wimmer H, Perner J (1983) Beliefs about beliefs: representation and constraining function of wrong beliefs in young children‟s understanding of deception. Cognition, 13:103-128. Wolkenstein L, Schönenberg M, Schirm E, Hautzinger M (2011) I can see what you feel, but I can't deal with it: Impaired theory of mind in depression. J Affect Disord, 132:104-111. Zobel I, Werden D, Linster H, Dykierek P, Drieling T, Berger M et al. (2010) Theory of mind deficits in chronically depressed patients. Depress Anxiety, 27:821-828.